“Hear, oh my son…” Who is the man who can speak thus to another person? Benedict, who withdrew from the world, who withdrew into himself, seen by the Supreme Witness alone, in order to live the blessing – that is his name: Benedictus – that is placed upon each person by the Word of the Eternal Father. So Benedict welcomes brothers who like him want to return to the Father through the labor of monastic obedience: for there is One (who is the Lord and companion on the monk’s road) who went this path of obedience for us. Jesus gives the Spirit to every person who stands up in order to respond to the call. This Spirit will make of him and her a loving son and daughter of the Father and an obedient brother and sister to their sisters and brothers, so that the power of communion which God was pleased to give to the humble and the small in the risen Christ may be revealed on earth. Benedict’s path has a frame: the monastery. Places: the oratory, the Bible and the workshop. A duration: life! How could it be otherwise, since in the school of the Lord we become sons and daughters, brothers and sisters of God’s life itself? A dream of bricks and of frescoes in the graceful Italian architecture, in the austerity of a wooded place of withdrawal, cut off from the charm of Tuscany through limestone ravines. The abbey of Mount Oliveti is the fruit of another dream. 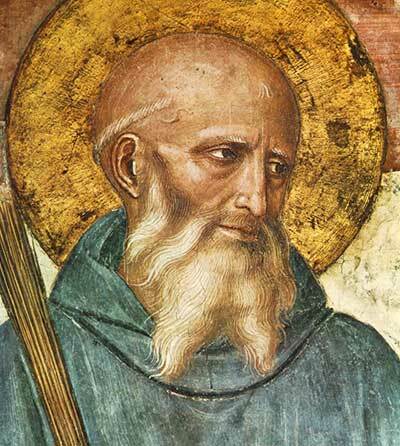 That of a citizen of Siena who, in the Italy of the 14th century, was enamored with solitude and with consecration to God. Bernard Tolomei left his native town, his family, his renown, and departed. He took with him the Rule of Saint Benedict, plows so as to work with his hands, and books for studying. He left in the plural. For Bernard did not go away alone; he took brothers with him who had the same dream as he: to build a house of God. One single body of brothers – unum corpus – each one established in the mystery of his solitude before God, and united in celebrating the sweetness of a fraternity that was based on this one desire which Bernard recognized in his heart: to obey his brothers. Thus a new father was born to monastic life who, in the 19th and 20th centuries, would “welcome” brothers from the four corners of the earth, who came to receive from him the seal of this monastic authenticity, which even in its very different modes, recognizes itself through its family spirit that Bernard sealed in the simplicity of his monastic journey and the strength of unum corpus, which draws its rules of life and of development from the Rule of Saint Benedict. Who can preside over a meeting of men and of women, of monks and of nuns gathered together in order to pray? 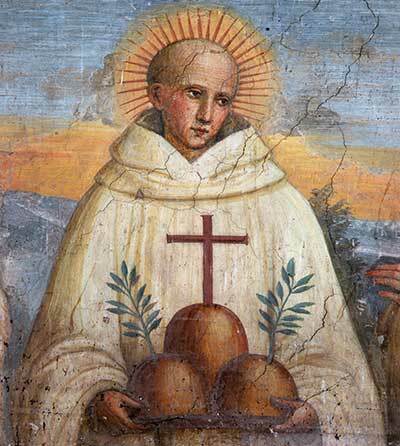 When in August 1425, Dom Hippolitus, surrounded by his own Olivetan monastic community, received Frances Ponziani and her companions for the “Benedictine oblation” in the church of Santa Maria Nuova in Rome, he did not know that this ecclesial act and the intuition that he was sealing would lead to a “covenant of prayer” in which the Church would recognize its own face. What intuition and what face of the Church? With Frances, who is called the Roman because she served and loved her people well, everything began with its opposite: she wanted to be a nun and was married; she sought the peace of the monastery and she had to watch not only over her own household but also over the “House of the Church” that was torn by factions; she united her companions in the service of the poor and in the reality of the most concrete miseries, and with her companions she discovered in this service the meaning of a Benedictine oblation that would lead to the foundation of a monastery. 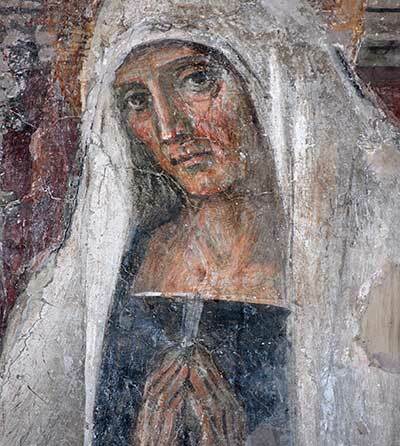 She saw a life of prayer, of meditation on Scripture, and of Benedictine formation leading to this foundation, which was the cause of great controversy. Her only dream was to take the last place when her husband’s death freed her from family obligations… and she found herself in the first place, consecrated and recognized by those who were with her, by the pope, by the city, by the love and fidelity of her Benedictine spiritual brothers and fathers, who had supported her throughout her journey of consecration to God, to the Church, and to the peace of the Church. What was this woman’s secret other than the love of Christ, who was served in conjunction with a male monastic community, to which Frances gave all she had in feminine intuition and in her sense of interiority, thus receiving in her turn, in her gift of self to Christ, the strength to serve others, all others, no matter what form the events gave to this oblation? She “breathed” this strength of soul in the spirit of Saint Benedict. She placed the foundations for a union in prayer between men and women, which had to lead to recognizing in the joy of this gift that was common to all of them, the secret of the movement that draws the whole Church to its Lord. She gave a living image of the Church to all who, following her, were willing to sit in the shade of the Beloved in order to understand what Love is. Why was a woman needed to teach us this? The question itself bears the answer.